My brother always emails me about cool art shows he sees in NYC. 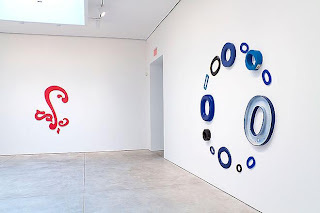 This week, he sent me an email regard this installation sculpture/wall art show at Cheim and Reid in Chelsea. The artist is Jack Pierson, and it looks like a pretty cool show. 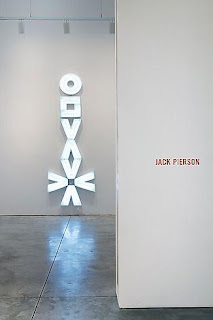 Upon further reading on the gallery's website, I discovered that Pierson is from MA and studied at MassArt! Here are some exhibition photos from the C+R website. My favorite one is the circle of blue circles, as I think that's the best and simplest way to describe it, haha, named ABSTRACT #15. Bringing back a post I wanted to include in my blog from the beginning, here's an inspired look. 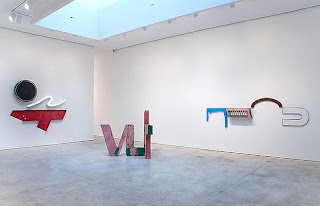 What do you think of installation art? His pieces look very cool! Love the outfit you created from it. That art is amazing. So colorful and fresh. And I love the outfit you created to match it. The dress is perfect! always love me some inspiration art. I'm a big fan of installation art. I loved the collage you created based on the art. Very inspirational! oh i like that circle of blue too. I appreciate installation art because it challenges my notions of what constitutes museum-worthy art... Very cool post, darling J! I love your collage inspired by the exhibit, especially those booties! How creative are you??? What a fabulous way to tie in fashion! Ya, I knew this would inspire a cool outfit! The blue top is adorable and installation art is incredible because it gives you a new perspective on the idea of art and how you look at it, y'know? it's def interesting. never thought to inspire an outfit out of it but i like what you've done there. you're so creative! Thanks fro introducing me to installation art. I will have to go and read all about it in wikipedia!